The ​ ​CR Lions Club Variety Show - fundraising event which was ​ ​originally ​ ​scheduled for 09/25 had to be postponed due to floods near downtown during that time. ​​The event is ​now​ ​rescheduled to be ​on Sunday November 6th from 3 to 5PM at Scottish Rite Temple. Some of you might have bought tickets for the event and those tickets are still valid for the event on the new date. 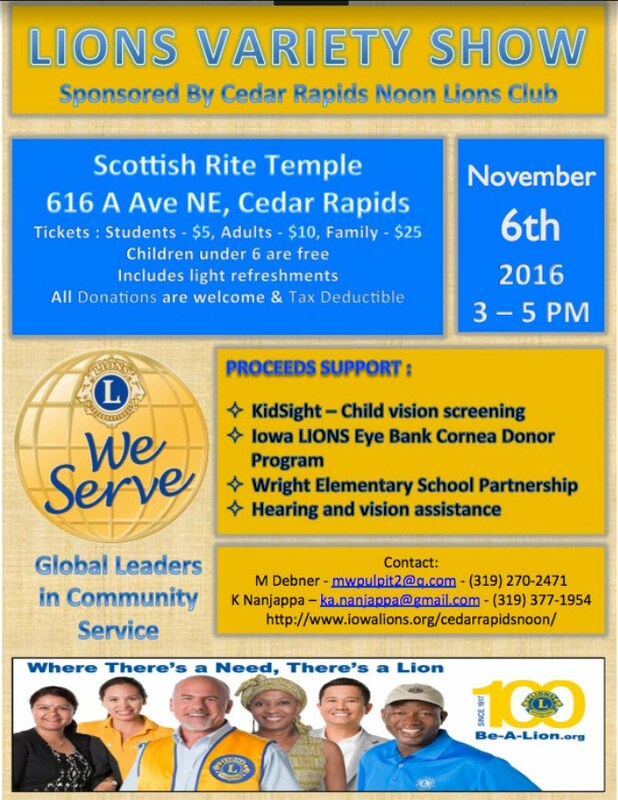 I have been a member of the Cedar Rapids Noon Lions Club for several years that supports various sight saving and hearing aid programs that benefit local community who need help. Please come, enjoy the variety show and support a great cause! Tickets are $25 per family and $10 per individual. Light refreshments will be served. Tickets can be purchased from me or Paddy Puthige. Additional contributions are welcome. Your donations are tax deductible. Please bring your old pair of eye glasses and/or hearing aids. Lions Club will make sure that it will reach a needy person.